An amazing Everything Bagel Recipe! This is a revolutionized way of making bagels. The process is so much easier with just as amazing results! The inside of the bagel is soft and airy while the outside is chewy and crispy. A great recipe to enjoy plain, topped with cream cheese or as your favorite sandwich. These bagels will be loved just as much as the Russian Bread and Braided Bread recipes are. This is a “cheat” way to make homemade bagels with ingredients you most likely already have in your pantry! Soft and chewy bagels with a crispy crust topped with everything seasoning. The dough is the perfect mixture of soft bread and classic bagel in one, you can’t go wrong. The everything seasoning has a mixture of toasted sesame seeds (black and white), poppy seeds, dried garlic, dried onion, and salt. We purchased our everything seasoning online but you can make it at home and adjust each ingredient to your liking. This is a quick way to make bagels. 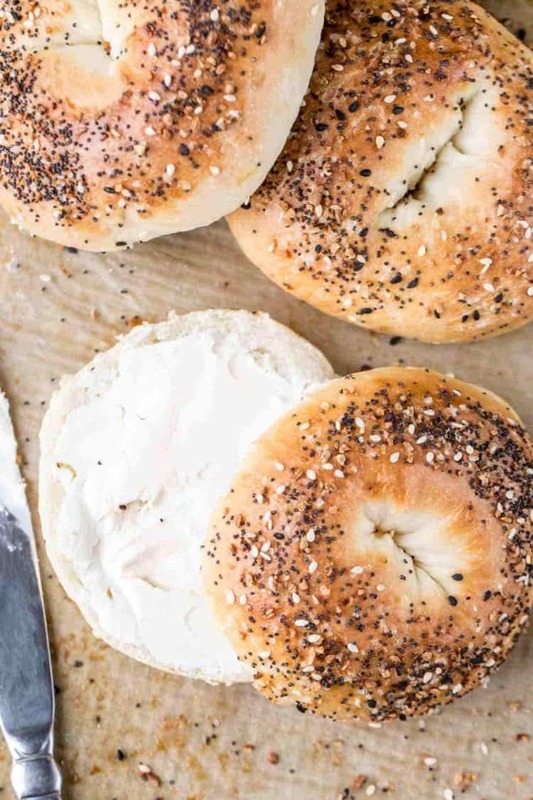 Unlike traditional bagels where you must bathe the bagels in boiling water, this recipe is so much easier! PREPARE DOUGH- Combine the milk, water, sour cream, butter, oil, and salt. Whisk together. Place on a stovetop and heat until warm, NOT HOT! RISE- Remove from heat whisk in sugar and yeast. Allow yeast to activate, about 2 minutes. Add the sifted flour. Mix until well incorporated, set aside to rise until the dough has doubled in size. 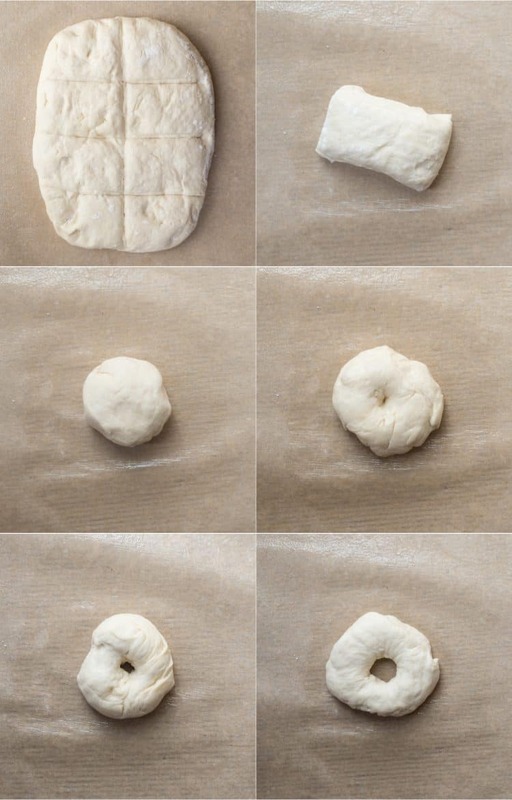 SHAPE DOUGH- Divide the dough into 8 parts and shape each part into a ball. With your finger, press through the center of each ball to make a hole and pull on the dough to shape dough into a bagel shape. The hole should be about 1 ½” in diameter. TOPPING- Transfer bagels onto a lined baking sheet. Brush with egg wash and top with everything seasoning. Rise again. BAKE- Bake the bagels until crispy tops of bagels are crispy. NOTE: If you don’t want the hole in the bagel to close, use bagels MOLDS. CREAM CHEESE- Toasted bagels with cream cheese spread. SMOKED SALMON- Smoked salmon with a garlic powder cream cheese spread is amazing. AVOCADO- Add avocado, and any other topping but even avocado itself is great. MEAT- Ham, bacon or sausages paired with egg and cheese goes so well with this bagel. PIZZA- Cheese with marinara and pepperoni, then the bagel toasted. VEGGIES– Scrambled egg with veggies (similar to our omellete). BURGER- Enjoy the bagel with a burger and favorite toppings. EGG SALAD- Serve bagel with egg salad. TUNA- Toasted bagel with tuna spread (like our tuna sandwiches). Plain bagels- because plain bagels are just good. Poppy seed bagel- after brushing with egg wash, add poppy seeds to taste. 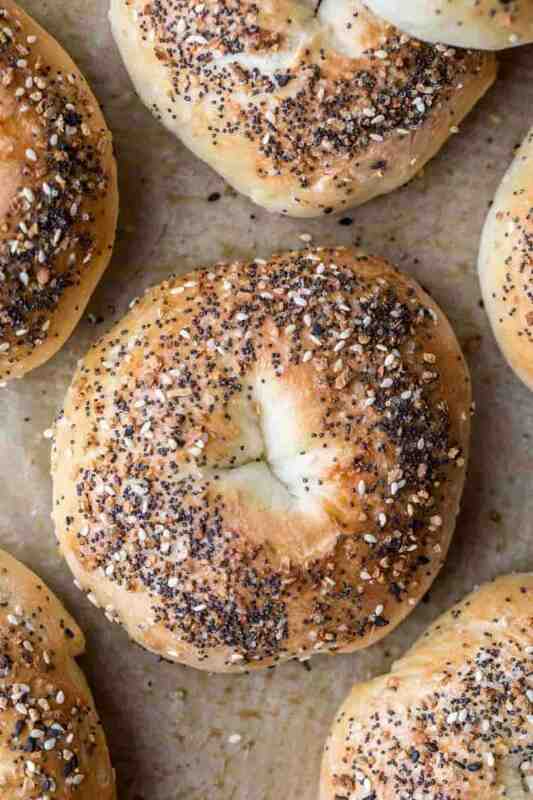 Sesame seed bagels- sprinkle black or white sesame seeds for topping. Cheese bagel- sprinkle bagel with your favorite cheeses and bake. Cinnamon- sprinkle cinnamon over the top of the bagel after brushing with egg wash.
Raisin- for raisin bagels, add raisins to the dough when kneading. 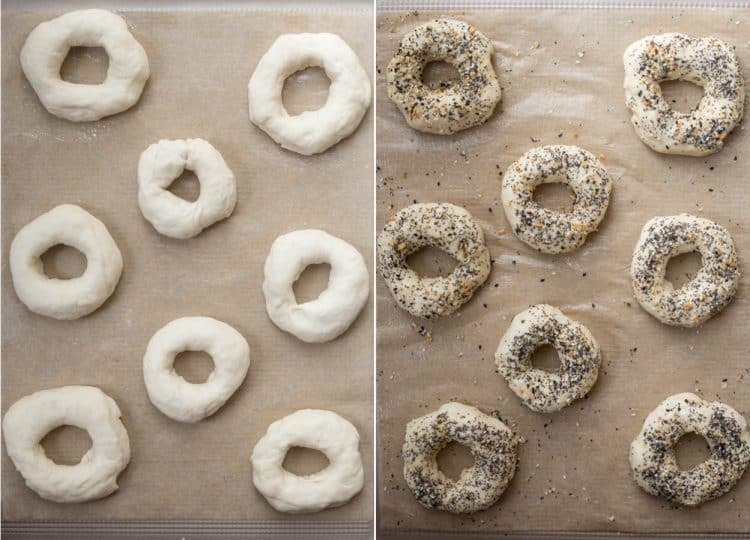 Yes, these homemade bagels may be frozen for later use. Once baked and cooled completely, freeze for up to 3 months in an airtight bag. You want to use GOOD quality flour, we used Canadian flour which has higher gluten in it. Also, be sure to sift your flour once it’s measured out. Butter Herb Braided Bread– Bread with herbs and butter. Uzbek Lepyoshki– Traditional Uzbek bread. Lemon Blueberry Cake Loaf- Soft bread loaf with fresh blueberries and lemon. Easy Dinner Rolls Recipe– Homemade, from scratch rolls. Great homemade everything bagel recipe. Soft on the inside and crispy and chewy on the outside. The best kind of bagel. In a saucepan, whisk together the milk, water, sour cream, butter, oil, and salt. Heat until warm. Remove from heat. Add sugar and yeast, stir. Allow yeast to activate, about 3-5 minutes. Add in sifted flour and mix until flour is well incorporated. Cover and set aside to rise at room temperature for 1 hour, until doubled in size. Line a baking sheet with parchment paper and lightly spray with baking spray. Divide the dough into 8 parts. Shape each part into a round ball. Press finger through the center of each ball to make a hole. Pull on the dough to shape into bagel shape. The hole should be about 1 ½” in diameter. 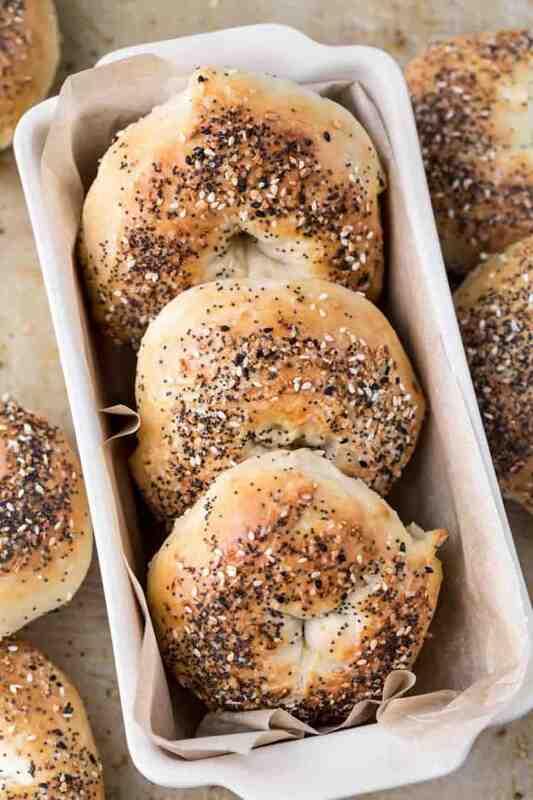 Place bagels onto the baking sheet. Brush each bagel with egg wash and tops and sides of bagel. Season generously with the everything seasoning. Allow bagels to rise for 30 minutes. 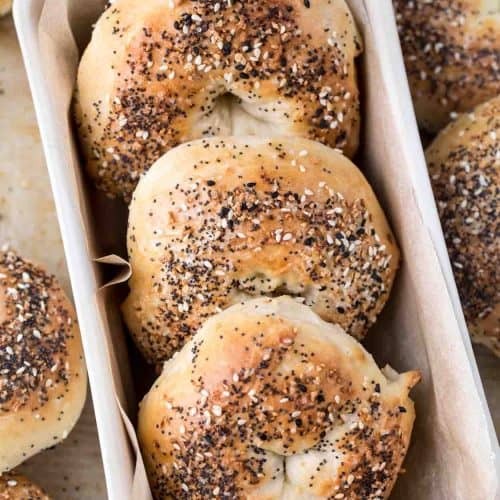 Bake at 375°F for 20-25 minutes, until tops of bagels are crispy and golden. Can these be made with no salt? Just curious for heart patients. You can make these without salt, Sue. Amazinggg. I always wondered how does the bakery people make such bagels. Thank you for this. I’ll try this at home. Thanks so much, Gabriella. I love you love the bagel recipe as much as we do!